A Hangout is a web-based tool created by Google for communicating through video. Up to ten people can "hang out" at one time in a virtual "room." A Hangout can be as simple or as complex as needed for the task at hand. It can be used simply to converse or, through the use of extra apps and add-ons that Google provides, a Hangout can become a robust, virtual meeting space. One of the best aspects of Google Hangouts is that all you need is a Google Plus account to start one. If you already use Gmail, that means you already have a Google account, and all you would need to do is set up your Google Plus account. Anyone you want to talk to also needs to have a Google account and a Google Plus account set up. Once those first steps are out of the way, all you have to do is click "Start a Hangout," invite some people and begin your live video conference! For more information, watch this simple overview of starting a Hangout. Since Hangouts allow for a number of people to participate at one time, they can be great for connecting classrooms. Imagine a book club spread out over the country with classes meeting weekly to discuss what they have been reading. Hangouts can also be a great way to connect experts with students all over the world. For example, in that nationwide book club, authors can talk with numerous classrooms at one time. Scientists can speak to a wide audience of students about a relevant topic or event, or just to share their experiences as scientists. Many of the applications for elementary classrooms can be applied to middle and high school classrooms, but since students 13 and older can create their own Google accounts, Hangouts become a great way for students to engage in connected learning experiences with their peers and with experts. Imagine a 15-year-old with a penchant for graphic design sharing his or her designs with other artists around the world through an online art critique, or a high school senior using Hangouts to study and discuss classwork with his or her friends. Imagine a teacher holding "office hours" once a week in the evenings for students who need extra help. All teachers know that they can't be an expert at everything. The great thing about being a teacher these days is that you don't have to be. Through the power of online networks, it is now possible to connect our students with experts in every field imaginable. If your students are working on a project and are stuck on a particular section or concept, you can connect them with an expert to help them through it. For instance, if you have some engineering students who need guidance on a building project, or a student who wants feedback on an article he or she is writing for the town newspaper, they can connect with an engineer or a journalist to help them through the process. Since Hangouts allow for up to ten people to communicate at once, this mentor's reach can stretch way beyond one classroom or one group of students. Mentors do not have to be adults, either. Maybe a freshman needs help with a paper or math concept -- why not connect him or her with a peer or an older student? This student can now get one-on-one help after school through screen sharing, chat options, shared Google Docs and other features built into the Hangout. All of the uses described above can also be applied to college and university classrooms. In addition, by using the Hangouts On Air feature, professors can record Hangout discussions as a resource for other students. Professors can also hold virtual office hours when they wish, making themselves available to students who may not live on campus or be available during their regular office hours. For classes that are taught mostly online, this kind of communication can be a real game changer, making it easier for students to connect with their teacher on a more personal level and bringing a human element to what can sometimes be an alienating experience. Just as administrators and students can learn from each other through Hangouts, educators can also benefit from sharing resources and ideas with each other this way. Hangouts can be a great way for teachers to facilitate a book study across grade levels, schools and even districts. They are also ideal for teachers who want to receive training or information on new technologies, research and practices from experts in the field, much like their students may be doing in the classroom. These sessions can be recorded using Hangouts On Air and archived as part of a school's professional development offering. 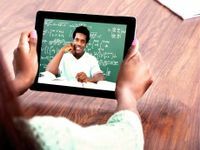 There are a multitude of ways that Google Hangouts can make learning more engaging and personalized for students, teachers and administrators. This free web conferencing tool can make a big difference for classrooms by connecting students to people outside of the classroom, and it can make regular communication and collaboration much easier for teachers and administrators. For more on how Hangouts enable communication, this webinar gives a good overview of the basics.